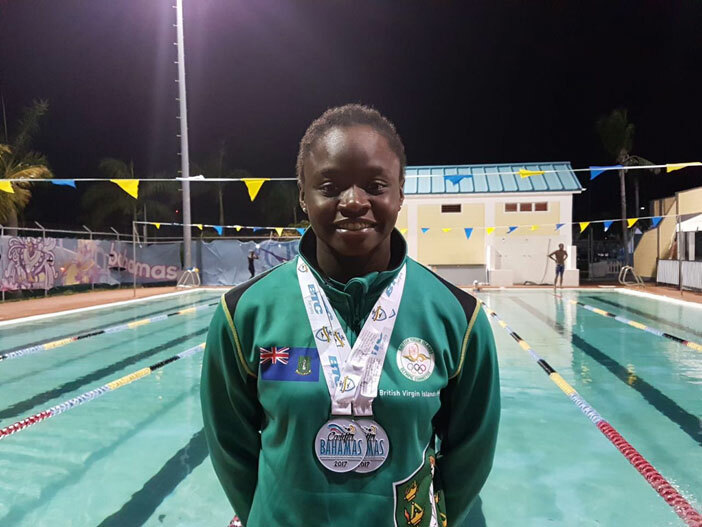 Elinah Phillip was a double silver medalist at the 32nd Carifta Games Swimming Championships in Nassau, Bahamas. Phillip, the territory’s top swimmer, grabbed silver in a scintillating 50m Butterfly in race with Martinique’s Mika Heideyer who edger by .01, 28.12-28.13 seconds on Sunday. Phillip advanced to the final in what was then a Carifta record, 28.47 seconds. She followed up by swimming in the 100m Freestyle on Monday, which she said is not one of her strongest races but had the fastest qualifying time into the final of 59.30 seconds. Phillip placed fifth in the final in 59.62 seconds. Phillip wrapped up her Carifta Swimming sojourn with a 50m Freestyle silver on Tuesday evening in one of her favorite races, finishing .04 seconds behind Trinidad and Tobago’s Arima Pilgrim, who recorded a time of 26.73 seconds to her 26.77. She advanced after a 26.67 time in the prelims. With the Carifta Games behind, Phillip said she’s looking forward to the FINA World Jr. Swimming Championships and the World Swimming Championships, as well as the UK Championships before that. “I’m looking forward to some fast swimming,” she stated.